Blog Quick Quotes: Thankful for You with Kate! Thankful for You with Kate! Don't forget we have a giveaway going on the blog - check out the post here. Happy Saturday Quick Quotes Fans! Kate here. Keeping it simple for you today with a layout of my beautiful daughter, Lily, using the gorgeous papers from Quick Quotes Treasure Chest Collection. The purple, grey and black color combination in the Treasure Chest Collection is so unique. It is perfect for both masculine and feminine projects. For my layout I went with a clean design and feminine feel using all of the papers from Treasure Chest. The sentiment I used on my layout matches this line splendidly. It is from the Quick Quotes Sentiments Bundle. 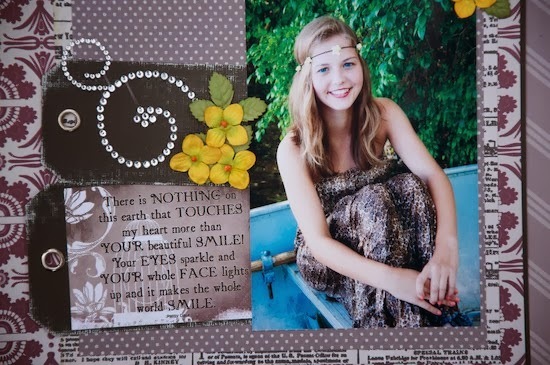 The colors and sentiment are the perfect embellishment for my layout. Patsy definitely has a way with words! You can see it up close in my picture below. I really love the Treasure Chest Collection! Thanks so much for stopping on over today! Have a wonderful weekend!!! Gorgeous layout! I love how those papers match her dress. Love this layout! What a sweet photo! The layout showcases it perfectly! !